Can a Wet-Dry Vacuum Help with Solid Plumbing Clogs? Solid plumbing clogs can develop in a variety of ways. They can come from any hard item that is thrown down a drain. This often comes when kids play along with a drain and throw stuff like toy cars in them. Sometimes food wastes might be a little too hard to handle as well. Regardless of what causes this problem in your plumbing system, you can always get some of these tough clogs removed with a wet-dry vacuum. This is a type of vacuum that is designed for handling wet or dry conditions alike. It uses a larger canister that is secured enough to take in all sorts of materials. This can be emptied out as needed too as it can take in plenty of water and solid materials alike. This is perfect for when you’ve got something that has been jammed up in your plumbing system and isn’t coming out on your own. A vacuum like this will use a simple setup that isn’t too hard to use. 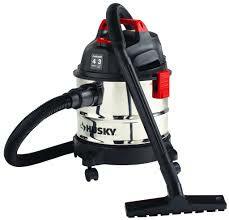 Best of all, it is easy to rent one of these vacuums if needed. You can always go to a local home improvement store to rent one. Some supermarkets even offer rentals. To start, you must check the instruction on whatever you are using. You must ensure the vacuum will not be in any spots where electric hazards might develop. This is especially important as failing to use it properly could cause you to lose your deposit on a rental if applicable. You’ll have to get the hose for the vacuum added into the drain. This works best when the drain is dry as it allows air to move around without all that much obstruction. The vacuum should be set to a suction mode so it will draw air into the vacuum. This creates a setup where air moves inward to successfully clear out any blockages or other difficult things that you might be bearing with in your property. Be aware of any blow backs that occur. This is where the air will cause some splashing to occur. You will have to clean up this space yourself although it should not be too hard to get it cleared out. You can always switch between the push and pull functions on the hose to move air inward or outward. This is to create a plunger-like effect. It helps with loosening up all sorts of items inside the setup. The force will still be greater than what you’d get with a more traditional material. This is a process that can make a real difference when you’re aiming to keep your plumbing system clear of these difficult clogs from objects and other solid items. Be sure to work hard with a great wet-dry vacuum if you want to keep what you have secure and easy to handle for any demand you hold.